I am excited to announce a review partnership with The Pen Company, a small family run stationary retailer in the UK. I received the following product from them for review, however, this does not sway my view of the product. In trying to chose a review item, I wanted to choose something 1) I've never owned or used 2) preferably something something I've never seen reviewed (because I'm prideful). These are both selfish reasons I know. Hopefully the choice comes to bare to aid in your purchasing. For some reason, I was interested in trying a multi-pen. I don't use one often and when I do it's the Hi-Tec C Coleto Me. Their concept, however, intrigues me, a vertisble Swiss Army tool of writing instruments. In my search I stumbled upon a multi-pen produced by Fisher, to whom I connect the famous Bullet Space pen with its patented pressurized ink cartridge. I knew they made other pens, but I had not seen one, until now. It fit my parameters and The Pen Company's, and, two weeks later, the pen showed up in the mail from across the pond. 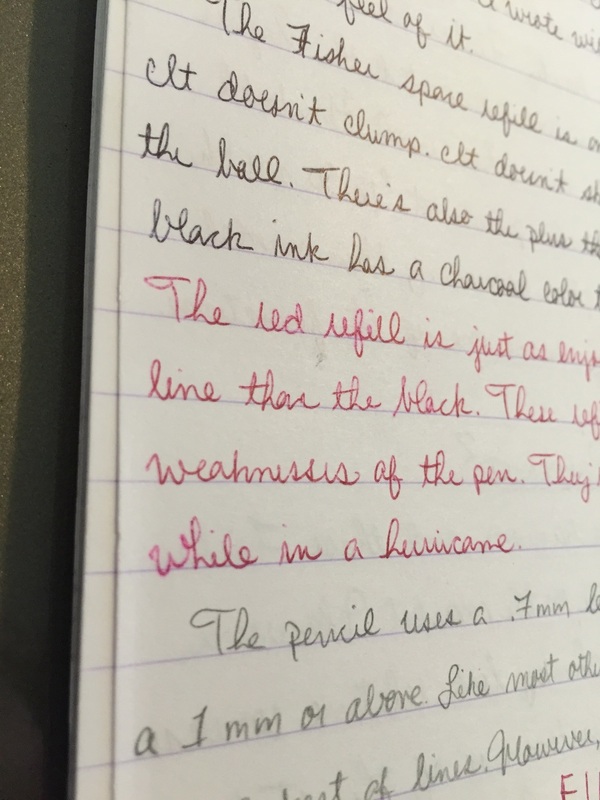 I was excited about getting a new pen and starting this new aspect of the blog. It seems I caught my office manager, Steve, in an equally excitable mood. We opened the box together finding the pen in the Fisher 'space case.' I gave him the honors of trying it first, since it wasn't a fountain pen (he's more keen on rollerballs but I forgive him). He took it out of the box. We both looked at the gunmetal barrel and ribber grip, and the four functions printed on the top of the barrel right below the nock mechanism. He clicked the nock and out came the stylus. He clicked the release button, clicked the nock again, and out came the stylus. He repeated this one or two more times before I snatched it from him in impatience only to find the same results from my attempts. After 5-7 minutes of varied success getting different functions to come out, black ink, or red ink, or the stylus would come out, but never the pencil. There seemed no rhyme or reason by which to eject the desired function. As we were sitting out in the front part of the office, the parish secretary probably thought it was hilarious, us sitting there trying to figure out how the mechanism works properly. At her commensensical recommendation, we decided to look at the directions provided by Fisher (did I say pride earlier, add stubbornness), and they didn't disappoint. Once we 'figured it out' we were both completely fascinated by the pen. (I've got to leave some suspense. I'll tell you how it works later. I guess I'm a prideful, stubborn tease). Steve then went all around the office showing everyone how it works. For the next 30 minutes, every visitor to the office got a demonstration of the pen's operation. I think I effected the efficiency of the office that day. I carried the pen in my shirt pocket for three months and have a good handle of it. Here, then, are my thoughts. Fisher prides itslef on creating writing instruments for the space age. That futuristic aesthetic is present in our current charge. The pen is sleek and unadorned. It says I'm here to take scientific measurements on the moon, in mulitiple colors. The pen is larger than the Pilot G-2, and its slender length gives the feeling of an apollo rocket. 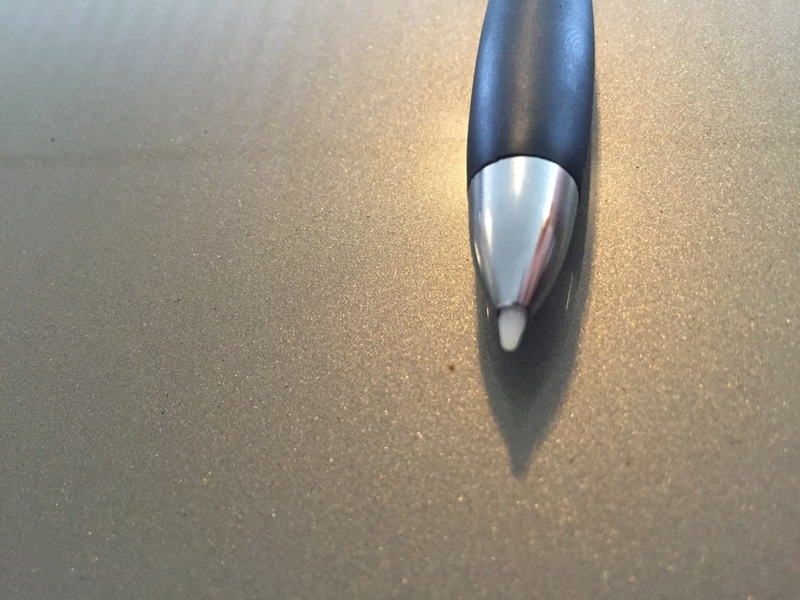 The body bulges slightly at the rubber grip section giving the whole pen pleasant lines. The body has a gunmetal color to it. Although such a color lends itself to the thought of space age, as opposed to teal or pink or Irish green, it leaves the pen looking like a fancy advertisement pen. Instead of looking ready for the space age, it looks more comfortable at the doctor's office or with a law firm's name on it, leaving the pen looking cheap. The chrome accents at the tip, in the band above the grip section, in the click mechanism, and with the clip up the class just slightly. Even so, all of the colors of the pen balance well. The black of the grip section mixed with the chrome accents find a happy tonal medium in the gunmetal grey of the body. This monochromatic feel gives the pen a '50's futuristic aesthetic in line with what I would think Fisher was looking for, but it still looks cheap. The branding is simple with its white words sitting nicely within the greyscale. Above the grip section band, is says "Q-4 PEN by FISHER." Below the cap, written in the same font are the four functions of the pen: Red, Black, .7mm, and Stylus. Stamped in profile on the side of the clip is "Japan," which makes the pen look cheaper still. After spending three months in a breast pocket the printed branding is starting to be scratched off; eventually, after a few years of hard use, it will become impossible to know what function is being chosen. I do like the interplay between the dull black rubber of the grip with the polish of the body and accents. It settles the eye after all that reflection, a reflection which gives the greyscale a vibrance black and white film wished it could convey. This is where this pen shines. It has a unique mechanism to 'discharge' the desired function. It uses gravity to determine which function is ejected for writing. The names of the four functions around the top of the barrel are not just decorative reminders but are functional keystones (pun intended). The function whose name faces up when the pen is horizontal will be the function that is extended. This is where myself and the office manager ran into the random ejection experience. We held the pen vertical, like every other pen is held, when ejecting the refill. We hadn't operated the pen correctly, hence the headaches. We were telling it to do something it wasn't made to do. This fascinated me the first week of use because it was new and a rather ingenious way to solve the multi-pen problem of multiple cartridges playing bed buddies in the same barrel. They have to play well together or there will be a serious problem. After the first week, however, it became more of a frustration. I still hadn't gotten the orientation of which function was where on the barrel for me to eject it, so I would end up spending a few seconds looking for my desired function. "Oh there's the red pen." This extra time seems counterintuitive to the click function of the pen. You have quick access, but wait, let me find the right passage way. 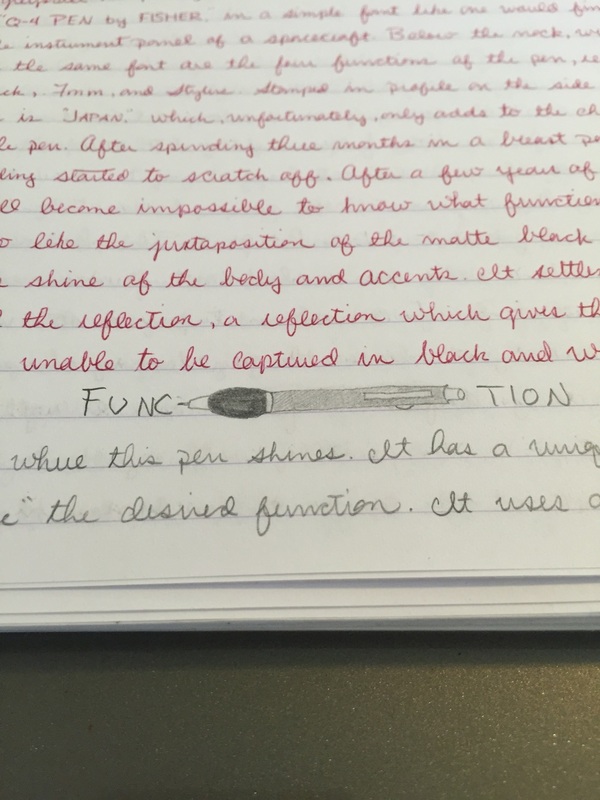 The pencil function, after being extended, requires another click to extend the lead. The nice thing is that I can leave the lead extended even if the pencil function isn't ejected. When I do find the pencil function to click I can get right to writing. I don't know when the pens were first produced, but the stylus is completely useless. It looks like an old Blackberry stylus. It is't capactive for the modern touch screen; it dosn't even work on credit card machines in the gorcery store. This basically makes the pen into a Q-3 + nothing. There is also a hidden eraser in the nock push. It doesn't look any different than the eraser on a Rotring, but it doesn't function as well. The nock,when engaged, is rather springy making it difficult to erase, because, when you push down, the nock just goes farther down. It doesn't lock to allow you to erase. I had to hold the nock to erase anything. Again, ease of use is the issue. The pen has a good weight to it, definitely having more heft than the analogous advertisement pen. The weight is situated at the grip section preventing it from being top heavy and leaving it feeling very comfortable in the hand. I like the feel of the rubber grip. It feels like my fingers are sitting on a lazy boy. The rubber itself has some shiftiness to it. It isn't dense or immobile like tire rubber. For a while I thought the shiftiness lent to the cheap feeling of the pen, but as I wrote with it I came to like the waterbed feel it gave. The Fisher space refill is one my favorite ballpoint refills. It's smooth. It has a consistent line. It can write anywhere, anytime. The black refill lacks some darkness of a good rollerball but the charcoal color is pleasant nonetheless. The red refill is just as enjoyable. It puts down a little bit thinner line that the black despite having the same tip size. These refills really help to make the pen something I'd use on a regular basis. They're enjoyable, pleasant, and useful. The pencil takes a .7mm lead. I prefer .5mm, but I can tolerate the width. Because of the relatively light weight of the pen (a Rotring is heavier) along with the particular installed lead it doesn't put down a very dark line. I can always change out the lead to something more my liking. The Fisher Q-4 is $48.37 at The Pen Company. This is below the Lamy 2000 multipen, $57.66, and above the Lamy Logo multi-pen at $34.47. Although the price sits between these two pens, I don't think it would be as durable as those to Lamys. Consisering the advterisemnt pen-type body, the price seems high even at the $35 price range you find at discout retailers. The price might be attached to the unique nock system, which was probably some fun engineering R&D. I'm a little shocked, having experienced the build quality of the bullet space pen, and its simple beauty, Fisher couldn't have made something that looked nicer and warranted the higher price tag. This is especially the case when rival Uniball has its Jetstream multipen + pencil priced at $16.50 with a cheap plastic body. I'm assuming the model is also no longer in production since one of the functions is obsolete. I love the uniqueness of the mechanism, and those Fisher refills are some of the best ballpoints on the market. However, these two things don't redeem the chinky look, relative unease of the mechanism, and complete uselesness of the stylus. Not reverenced.